Pulse-pounding action meets cosmic horror in this exciting collection from the rising stars of the New Cthulhuiana, as humanity takes up arms against the monsters and gods of H. P. Lovecraft’s Cthulhu Mythos. 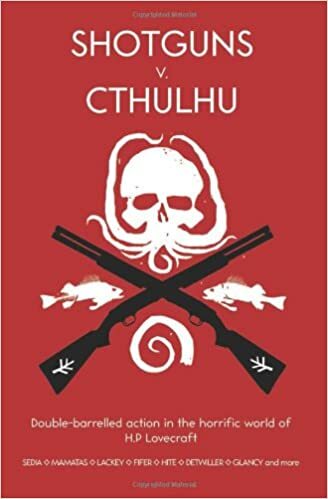 The fighting takes place in the past, present, and future, from the birth of the shotgun to the end of the world, and contributors who boast high name recognition among today's Cthulhu Mythos fans, including the cocreators of the Delta Green mythos setting and the cohosts of the H. P. Lovecraft Literary Podcast, relentlessly hurtle readers into the madness and danger. The complete list of authors includes Natania Barron, Steve Dempsey, Dennis Detwiller, Larry DiTillio, Chad Fifer, A. Scott Glancy, Dave Gross, Dan Harms, Rob Heinsoo, Kenneth Hite, Chris Lackey, Robin D. Laws, Nick Mamatas, Ekaterina Sedia, and Kyla Ward.